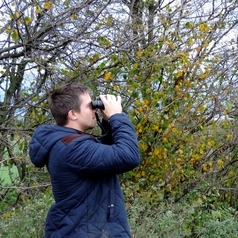 Since beginning my DPhil under supervision of Ben Sheldon in Oct 2012, I have had the opportunity to spend much of my time in Wytham Woods, undertaking fieldwork relating to the long term study of the breeding birds, the large scale monitoring of the winter community, and also my own field experiments. 1) Large-scale observational study of RFID tagged birds over an entire woodland for numerous years. Applying machine learning algorithms to this rich dataset allows social networks between individuals to be derived. From this, patterns in sociality can be identified and tested by combining standard statistical approaches with specially designed null models and empirically-parameterised simulations. 2) Field experiments using novel equipment to automatically apply experimental treatments. Using this approach, experimental treatments can be applied at the individual level, such as where each individual is allowed to access resources, which other individuals they can forage with, or their exposure to predation risk. These manipulations allow deduction of the contribution of different factors underpinning social structure, and, ultimately enables correlation and causation to be untangled, therefore allowing conclusions to be drawn regarding the influence of social networks on population level processes.